A photographic safari in Kenya and Tanzania was a rare and wonderful adventure. We had a number of opportunities to buy keepsakes from the local entrepreneurs. 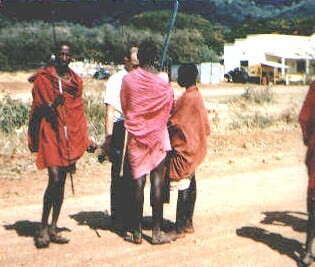 Here we are shopping for Masai shields and weapons. One of these fellows introduced himself in a heavy British accent as "Masai John". Seems he had been educated in England and had returned to his native Kenya to contribute to the local education and economic efforts.